VOCE DI MECHE: WE GOT WHAT WE VOTED FOR! We are happy knowing that we were among those fans of Utopia Opera who voted for Tchaikovsky's Eugene Onegin. For those of you readers who don't know, Utopia Opera is unique in producing their season by audience vote. This is Utopia Opera's sixth season and it has been a glorious one with the final entry giving us a unique up front and personal view of a long-cherished opera which premiered in Moscow in 1879. We love this opera because it gives us a glimpse of a highly structured society, one from long ago (1820) and far away (Russia). Nonetheless, we are seeing human nature as it is and always has been--just constrained by the mores of that time and place. We all can recall the naivete with which we approached our first love. We all know people whose pride gets in the way of self-fulfillment. We all have broken off friendships for trivial reasons. We have all known the pain of jealousy when our beloved has put someone else ahead of us. But this is not a "whatever" society; this is a society in which "honor" is taken seriously and revenge is serious and often fatal.. "Feeling pissy" and "walking away" are modern inventions. Tatiana falls hard for her sister's fiance's friend. Onegin is a city slicker and she is a country mouse. She overcomes her shame and shyness and bares her soul in a letter to him. He gives her a "Dutch uncle" speech in response. Not brutal but honest. At her name-day party, the eponymous Onegin flirts with sister Olga. Her fiance Lensky takes offense and challenges Onegin to a duel. Lensky is shot and dies. Onegin lives an empty sad life for a few years until he runs into Tatiana once more. She is now wed to the elderly Prince Gremin and rejects Onegin whom she still loves. How old-fashioned to put honor ahead of love! Of course, Alexander Pushkin's verse novel offers a great deal more elaboration but we will concern ourself with the opera as it is performed. As testament to the power of the story we offer our personal experience of fretting over what happens to poor Olga and whether Tatiana might reconsider when Gremin dies! As testament to the power of Tchaikovsky's music we confess that we are still playing the themes in our head! In this case, Jonathan Lyness' orchestral reduction was performed by 11 musicians under the baton of Dmitry Glivinskiy who brought out every ounce of Russian soul in the string quartet which sat at audience level, with the wind instruments and keyboard on one side of the raised stage. Aside from an occasional pitch problem in the strings, the music sounded just fine. The singing was good all around with soprano Megan Nielson making a winsome Tatiana and Melanie Ashkar using her lustrous mezzo-soprano and spirited dramatic instincts to create a very believable feckless younger sister Olga. Jeremy Moore used his mellow baritone to create an Onegin who seemed to represent a more modern sophisticated fellow rather than the arrogant selfish fellow of the Pushkin poem. We favor this interpretation because he must have some good qualities to win the affection of the sensitive Tatiana. And because we have good feelings about men who do not deceive women! As the poet Lensky, tenor Chris Georgetti gave his all and elicited audience sympathy with a finely wrought "Kuda, kuda". How interesting that the most famous aria from this opera, heard often at competitions, was not given to the "hero". Tatiana's "letter scene" is equally famous but rather long and not as often performed. (Coincidentally, we just heard and reviewed it the previous night.) We thought Ms. Nielson sang it very well with many shades of coloration. Milica Nikcevic was fine as Madame Larina, as was Noelle Currie in the role of the nanny Filippyevna, although looking much too young to be a grandmother. Steven Fredericks had the right voice (bass) and appearance to create the dignified Prince Gremin who has been rejuvenated by his young wife. Indeed Tatiana has by the end of the opera matured into her station in life and Ms. Nielson conveyed that vocally and dramatically. Finally, let us mention tenor Eric Alexieff whose performance as Monsieur Triquet was very fine without indulging in any over-the-top foppery. 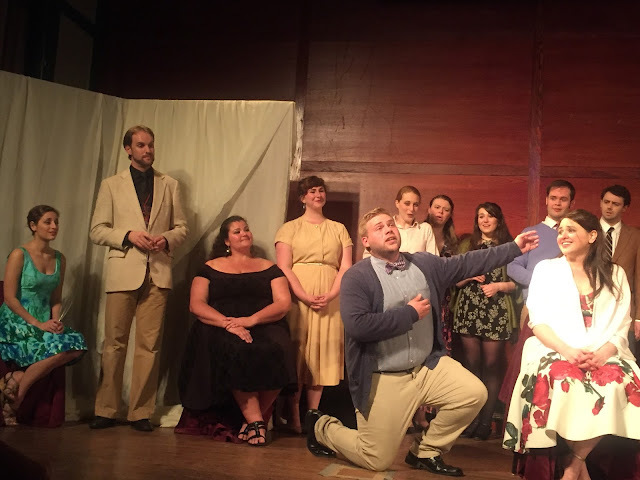 One of the highlights of Benjamin Spierman's direction was that very scene in which his musical encomium to Tatiana resulted in her embarrassment and some tolerant eye-rolling among the assembled guests. There were some other enjoyable touches in the direction of the second act including the flirtation between Olga and Onegin, the confrontation between Onegin and Lensky, and Lensky's aria in which he kneels down on the ground when thinking about the possibility of going to his grave. If Mr. Spierman was responsible for the choreography of the country ball and the city ball, props to him for that as well. The direction of Act I was not quite as interesting. There is a very special moment when Filippyevna teases Tatiana by pretending to not know which neighbor was going to be the recipient of her letter. By playing it straight, an opportunity was missed to tell us something about their relationship. We also didn't get much of a sense of the comradeship between Filippyevna and Madame Larina. We did, however, get the warmth of the relationship between the two sisters. The only major flaw in the production must be attributed to the costuming. We do not expect authentic period attire in a low budget production but we could think of ways to suggest an earlier time period that would have worked well. Jeans and shirts just seemed wrong. We don't know a woman who doesn't possess a peasant style blouse and a long skirt! Anything would have been better than the "just walked in off the street" attire. In the ballroom scene of Act II, all the women wore long gowns and that seemed much better. It also struck us as wrong that Filippyevna looked more glamorous than Madame Larina. Cutting the large chorus of serfs permitted the work to be performed in just over a couple hours. We were very impressed by the talent of the cast and how effectively the tale was told. We will see this opera over and over again but we doubt whether we will have the same feeling of intimacy with the characters as we did through Utopia Opera. There is one more performance tonight at Hunter College at 7:30 and we strongly recommend it!